The sleuce gates are OPEN! Let the glorious pumpkin orange sewage BEGIN!!! 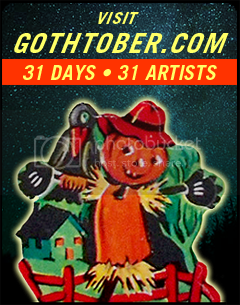 Gothtober is an online countdown calendar to Halloween, it’s got 31 doors, behind each door is a contributor. We hope one of those contributors will be YOU! The calendar is filled with creepy crawly goodies, from short films, to print-outs, to slideshow presentations, music, crafts, recipes and more! Check out our Frequently Asked Questions page to read up on the theme and get your questions answered about all things Gothtober. Throw the White Pumpkin at The Earth! • Day 31 3 Days Left to Apply for Gothtober!